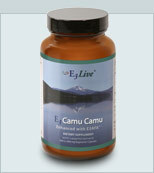 E3Live Camu Camu™ is a full spectrum vitamin C superfood. Camu Camu is an Amazonian superfruit that promotes wide-ranging immune health benefits. Based on studies and our own extensive personal use, we enthusiastically recommend this wild-grown botanical as an alternative to synthetic ascorbic acid, especially during flu season. As a superfruit berry that grows wild in the Amazon, Camu Camu's array of natural food factors and essential vitamins are more easily absorbed and utilized by the body, particularly compared with synthetic isolates which cannot compete with the genius of nature. That's why it's called Mega-C. For your full assurance, we literally stand behind the genius of nature! Several of us at E3Live® have been so taken with our own immune support experiences from Camu Camu that we chose to uniquely offer you our walk-the-talk unconditional guarantee when you buy from us. If you're not completely satisfied with the therapeutic results of E3 Camu Camu enhanced with E3 AFA™, we will refund your product purchase price, any time up to a year! Camu Camu has been revered as a key folk medicine for centuries by people living in the Amazon. In Western circles, Camu Camu is said to provide nutritional antioxidant and anti-inflammatory support for infertility, herpes, gum disease, infections, connective tissue and even depression. All this long-standing lore is what's behind Camu Camu's renown as a nutritive superfruit. We stay open-minded to the value of folk medicine that has been long accepted for its therapeutic benefits. Drug company labs make billions of dollars from synthesizing what's taken from original natural sources. We can use synthetic Vitamin C, or choose to take naturally occurring Vitamin C with its wide range of complementary bioflavonoids as found in the Amazonian superfruit, Camu Camu. Vitamin C is a power-packed vitamin in its full-spectrum natural form. Take good care of yourself this season with E3 Camu Camu™ enhanced with E3 AFA™. *Please Note: E3 Camu Camu™ is raw-living low-temperature dried. (The Camu Camu is dried below 115 degrees.) It is 100% Whole fruit: NO additives; NO fillers; and NO synthetic ascorbic acid added to increase our vitamin C levels. You can see the difference between our whole berry fruit powder, and other adulterated Camu Camu! 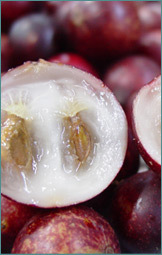 Here's one of our Camu Camu berries sliced in half to reveal the fresh pulp within. E3 Camu Camu Is Hand-Picked! E3 Camu Camu Is Wild-Harvested! Product Research & Technical Data — Below you will find some additional research and research resources regarding E3 Camu Camu™. E3 Camu Camu™ Research — The high Vitamin C content of Camu Camu is an instrumental factor in a surprising range of health-promoting effects including strengthening the immune system. 95% Camu-Camu, 5% AFA. We have added 5% E3 AFA™ to E3 Camu Camu™ to provide you with synergistic nutritional benefits. WOW! This stuff was great! I wish I would have bought more while it was on sale! I usually get sick this time of year, and I didnt this year, i truly attribute it to taking Camu Camu!! Thanks for another great product E3 Live!! I started taking these a week ago. Haven't felt any noticable differences. Love this product! I work at a hospital & am thereby constantly surrounded by illness. As of late, it's been the flu--my co-workers have been dropping like flies while I've been healthy--thank God! I owe it all to Camu Camu since it's high in Vitamin C.
Please Note The Food and Drug Administration has not evaluated these statements. This product is not intended to diagnose, treat, cure or prevent any disease.